For example in MVVM you have to implement iNotifyPropertyChanged notifier and this method is used in many properties. There are 3 types of Snippets are available. 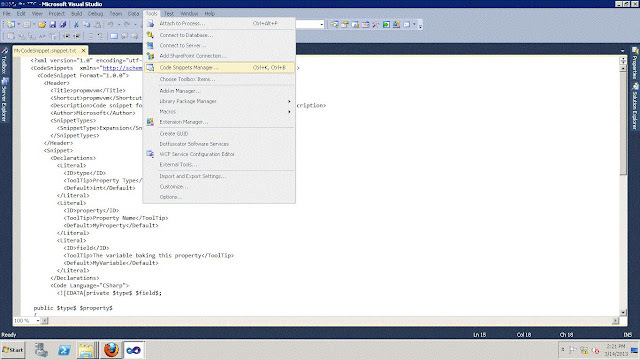 In this article I am creating expansion type of snippet for Property block with MVVM functionality that is iNotifyPropertyChanged. IntelliSense Code Snippets created in XML file. Step 1: First Create XML file in Visual Studio 2010 and save file as PropMVVM.snippet. Code Snippet file start with CodeSnippets element which has xmlns attribute for snippet. 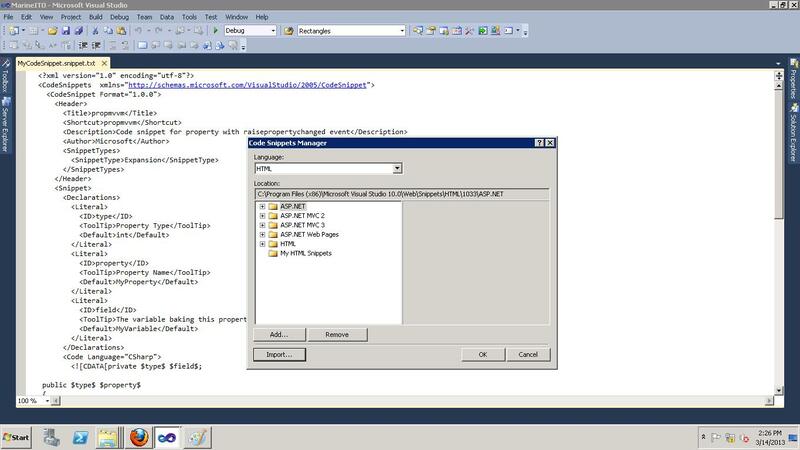 Step 3: Add Header Section within Code Snippet Section. This section has elements like Title, shortcut for IntelliSense and Description. Shortcut: when you type using Intelligence it will shows list of snippet including which you have created with given shortcut. Description: Detailed description of snippet on Mouse Over of you snippet. Author: Author Name of snippet. Snippet Type: which type of snippet are you going to create like Expansion (prop) or Surround with (try/catch). 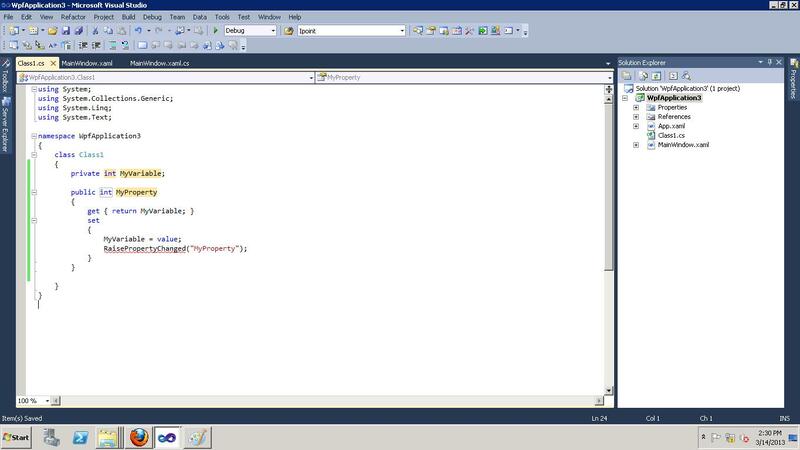 Step 4: Create Declaration section and then add Literals or Objects within Declaration Section. Literal Elements are editable values that are inserted by user into snippet. In the below code I have created Three Literals. Second Literal element is for editable name of Property. Third Literal element has field, user can gives any variable name that used within property Get/Set. Step 5: Code section describes the code for that snippets. 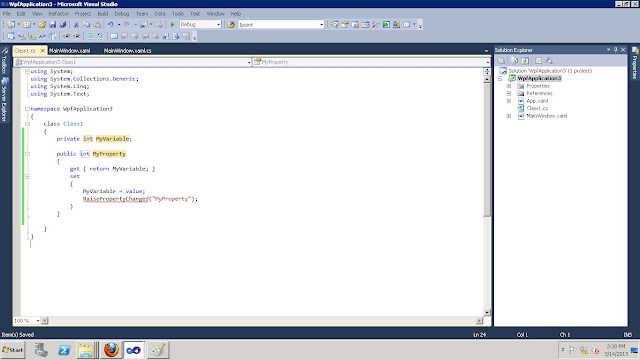 In this snippet is added language is CSharp, Inside the Code element, add the C# code for the snippet. Step 1: Open Visual Studio and click on Tool à Code Snippets Manager item. Step 3: Select location for snippets and click on Finish button, your code snippet imported successfully. Now you can use your snippet in development. 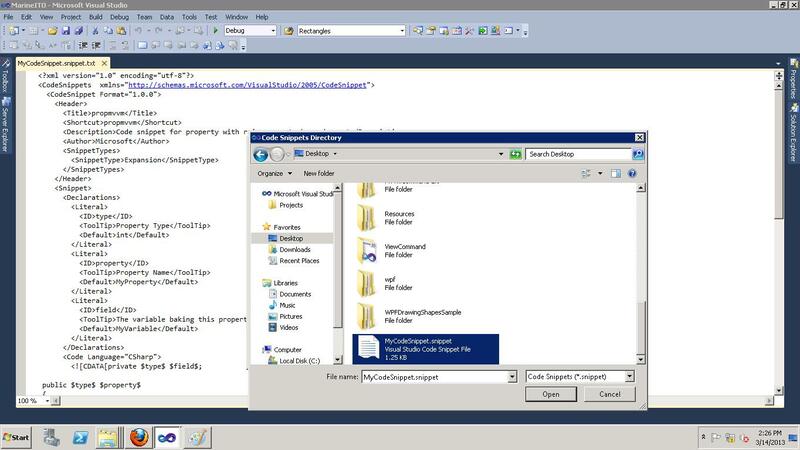 Step 4: Then Press OK to save the snippet in VS 2010. Create class file in your project. Then MVVM property snippet is added in your project successfully. In this way you can create your own snippets.